Maybe you’ve dreamed about being an archaeologist, simply enjoy history or want to learn new skills. We have a job for you! Volunteers are essential to fulfilling the Center’s Mission and we promise you will learn something new every day. The Center welcomes all volunteers and will work with you to discover what you enjoy doing most. To apply for a volunteer position or for more information, please email vol.intern@sandiegoarchaeology.org. Volunteers will prepare one or more archaeological collections for curation. Center staff will instruct the volunteer on archaeological laboratory procedures such as basic artifact analysis, manual and computer cataloging, storage requirements, and preventative conservation. Volunteers work in the Center’s Research Library, cataloguing materials and organizing on a computer-based system. Marketing and Administrative Volunteers assist the Development Office or Administration Office with data entry, updating marketing materials and clerical tasks. Computer experience is a plus. Docents welcome visitors and answer general questions regarding the Center and exhibits. Docents staff the gift shop and help out with administrative and curatorial tasks. Volunteers support event activities at the Center, such as the Annual BBQ, lectures, workshops, and fundraising events. Be a part of the party! Volunteer provide support for K-12 programs offered at the Center. These are fun, hands-on programs that kids really enjoy. Teaching experience is a plus, but not required. Background checks are required. The Center has been active in preserving the cultural history of San Diego County for over 20 years. We are a museum where visitors can learn the story of how people have lived in San Diego County for the past 10,000 years. In addition, the Center serves as an education and research facility and is the only local organization dedicated to the collection, study, curation, and exhibition of San Diego County’s archaeological artifacts. Our success and contributions to the community are in part due to the contributions made by our interns and volunteers. The Center is pleased to offer internships in Collections Management, Collections Research, Development & Marketing, GIS, Library Science, and Public Archaeology. The valuable archaeological resources curated at the Center offers interns the rare opportunity to work with millions of artifacts, thousands of archaeological reports and documentation never before brought together in one location. Interns can review archaeological theory and methodology of the past, as well as apply the latest ideas to existing collections. Interns gain experience in sharing this precious legacy with the public by designing exhibits or writing curricula. Interns may focus on a particular area of interest while conducting original research. Although schedules are flexible, interns are expected to complete a minimum 100 hours or the numbers hours required for credit within the semester period. In addition to program and research specific tasks, interns will perform any other related duties as instructed. Interns are required to complete eight hours at either SDAC community events or as museum docent. These additional activities count toward total internship hours. All interns must agree to abide by the rules and regulations of the San Diego Archaeological Center. With the assistance of Center staff, the intern will prepare one or more archaeological collections for curation. During the course of the internship, the intern will learn to identify artifacts and ecofacts common to the San Diego region, including lithics, ceramics, historical objects, and faunal, botanical, and mineral specimens. Center staff will instruct the intern on archaeological laboratory procedures such as basic artifact analysis, manual and computer cataloguing, storage requirements, and preventative conservation. 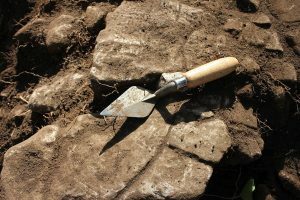 In addition, the intern will become familiar with historical trends in archaeological practice in the San Diego area and will be introduced to current legal and ethical issues in archaeological curation as well as the concerns and rights of culturally affiliated groups with regard to archaeological materials. With the assistance of Center staff, the intern will identify, design, and conduct an original research project that uses the Center’s archaeological collections. The intern will formulate a plan for public dissemination of the project results as a journal publication, a museum exhibit, or a public class or lecture. During the course of the research and dissemination planning, the intern will receive training in research design, collections management, artifact analysis, and exhibit design and production as appropriate to the selected project. Under the direction of Center staff, the intern will support the department in various activities, including, but not limited to, fundraising and grant research; e-newsletter development; social media marketing; tour web app content creation, integration, and management; and website maintenance. This internship will give the intern valuable, real-world experience in non-profit fundraising and marketing. Prospective Interns must have completed three courses: Introduction to GIS, GIS Database Management, and Intermediate/Advanced Methods in GIS. The intern will be assigned a project where they will create shapefiles and maps for curated archaeological collections, museum exhibits, and/or public outreach using ArcGIS 10.6. Center staff will instruct the intern on archaeological GIS laboratory procedures such as computer cataloguing, storage requirements, and database management. With the assistance of Center staff, the intern will arrange and catalog materials in the Center’s library. During the course of the internship, the intern will take a leading role in the cataloging, sorting and storing of research files and creating user guides for these collections. Center staff will instruct the intern on archival procedures, computer cataloging, storage requirements, and preventative conservation. With the assistance of Center staff, interns will research, design, and produce a project that educates the public about archaeology or a related field using the Center’s archaeological collections. Interns may create museum exhibits and related activities, develop curricula for K-12 programs in line with current content standards, or plan and present a public class or lecture. Per approval, special projects of the intern’s choosing are also available. During the course of the research and planning, the intern will receive guidance as appropriate to the selected project. Internships are open to all interested individuals and are available for college credit. The application process is similar for both credit and non-credit applicants. Schools, departments, professors, or professionals may refer interns. Interns may apply for 1, 2 or 3-unit internships with the approval of their schools and sponsoring departments. With approval of their sponsoring agencies, interns may apply for additional internships and may volunteer for non-credit experience. 1. Letter of Interest: address your background, goals, the intern position and why you want to intern with SDAC. Your documents will be directed to the appropriate department and you will be contacted with further instructions. Review some of the frequently asked questions from potential interns.